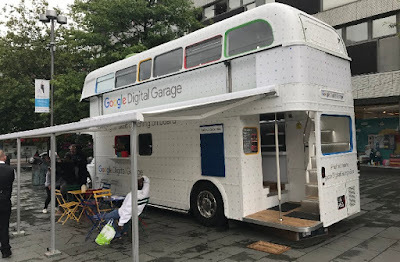 Free digital training for start-ups will be on offer at a unique location tomorrow as the Google Digital Garage bus tour visits Rotherham town centre. The mobile exhibition centre will be based in Effingham Square on Friday from 10am to 5pm, providing an opportunity for new and recently launched businesses to meet with Google staff and find out about the Google Garage based in Sheffield, plus other valuable support services. Alina Dimofte, digital skills policy lead at Google, said: "Following our ongoing success in getting people engaged and learning via our high street Digital Garages in Sheffield and Birmingham, we wanted to make our training even more accessible, so have started the bus tour to take training right to people's doorsteps." In last year's Tech City report, Sheffield and Rotherham were identified as one of 27 digital tech clusters in the UK, and used as a case study evidencing growth in the UKs digital tech economy. In the report, there were 14,313 digital tech jobs in Rotherham and Sheffield pumping £273m Gross Value Added (GVA) into the local economy. On Saturday, RiDO, the regeneration arm of Rotherham Council, will be offering free start-up advice at Parkgate Shopping from 10am to 4pm through its business support project - "Mighty." RiDO is a partner in the Launchpad business support programme that forms part of the Sheffield City Region Growth Hub. Funded by the European Regional Development Fund, it provides free help and support to budding entrepreneurs who are thinking of starting their own business, or have started trading within the last two years.